peace between Israelis and Palestinians? peace process if more were included? When did you last hear someone say something new about the peace process? And when did you last hear someone new say it? Every day, it seems, a panel of experts—diplomats, pundits, scholars, chin-pullers of all varieties—convenes to chew over the future of Israeli-Palestinian relations. These groups all have something in common: They are overwhelmingly male. The PBS program Frontline recently attracted criticism for asking 23 male experts and three women to reflect on the career of Prime Minister Benjamin Netanyahu. We at Moment have been offenders ourselves, printing past symposia on the Israeli-Palestinian conflict that featured far more male than female contributors. Partly this reflects the makeup of the military, diplomatic and foreign policy sectors, which lag in diversity of all kinds. But it’s not just that. Scanning foreign policy journals, social media and on-air punditry, you’d hardly be aware of the peacemaking successes achieved by women—in the Middle East and beyond. In 2011, Leymah Gbowee won a Nobel Peace Prize for her role in founding the Women of Liberia Mass Action for Peace movement, which contributed to the end of Liberia’s second civil war. A decade and a half prior, the Northern Ireland Women’s Coalition played a critical role in brokering the resolution to political and ethno-religious violence in Northern Ireland. Peace talks led and influenced by women in Guatemala, Darfur, the Philippines and Colombia have brought an end to long civil wars and internal conflicts. And former under secretary of state for political affairs Wendy Sherman recently led the talks that resulted in the Iran nuclear agreement. Despite these successes, women have generally been excluded from the nitty-gritty negotiations between Israelis and Palestinians and largely relegated to supporting roles. To be clear: Women have been involved in Israeli-Palestinian peacemaking for decades through largely unofficial channels. The 1980s saw the formation of several women’s groups, including Women in Black, Israeli Women Against the Occupation and the Israeli Women’s Peace Net. In 1989, Belgian activist Simone Susskind helped convene a conference of Israeli and Palestinian women, including activists Naomi Chazan and Hanan Ashrawi. Not only did this meeting lead to the establishment of the women’s organizations Bat Shalom (on the Israeli side) and the Jerusalem Center for Women (on the Palestinian side), but they succeeded in drafting and signing a joint declaration that recognized the need for two states to coexist. That same year, the United Nations Security Council adopted Resolution 1325 on Women, Peace and Security, which addressed the impact of conflict on women and called for their engagement in conflict resolution and peacemaking. This was followed up in 2005 by a UN-sponsored trilateral women’s group, called The International Women’s Commission for a Just and Sustainable Palestinian-Israeli Peace, which had little impact on official talks. While there has been an increasing number of women serving in the highest foreign policy positions in the United States, among them Secretaries of State Condoleezza Rice and Hillary Clinton, little has changed in Israel or the Palestinian Authority. The exception is Israel’s former foreign minister Tzipi Livni, who has twice led the Israeli team in ultimately unsuccessful peace talks with the Palestinian leadership. What perspectives might we be missing by ignoring so many women? What if we convened a group—diplomats, policy thinkers, activists, journalists—that happened to be entirely female? To do just that, Moment decided to ask women two questions: What more could be done to achieve peace between Israelis and Palestinians? What might women bring to the peace process if more were included? We provide a rare platform for the perspectives of young and old, feminist and nonfeminist, left and right, Jewish and Muslim, Israeli and Arab, American and European women. There are many more voices to include, so this is an ongoing project; more interviews are in process—including ones with Ashrawi and Albright—which will be part of an expanded e-book available at momentmag.com. August 21 - Women and religion in the IDF: where are we heading? 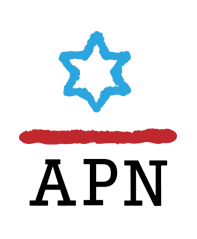 APN strongly condemns today’s terrorist attack in Jerusalem.